For this episode of Caitie’s Chandler Crawl, I wandered around under CCA to see what I could find. There are three things in life that creep me out: Hearing something move in the dark, the mouse from Chuck E. Cheese, and heights (I have photo proof of the last two. Ask me about it sometime). But since Katie gave me the suggestion to feature the catwalks here at CCA in my Tech Tuesday posts, I had to give it a shot. Had I been able to think clearly, I would have gotten photos of the guts of the building before we enter the catwalks that lead into the main theatre, but thinking clearly just wasn’t happening. Those are some shots of the catwalk overlooking the stage. The catwalks are mainly used to help position and adjust lights and sound for the performances. They also help techs do maintenance or move around the theatre if they need to do so quickly and quietly. Since we have three theatres at CCA, the catwalks have to be positioned above all three while still remaining hidden. If you remember the Tech Tuesday: Lighting post, I took a shot of a bank of lights from the stage. 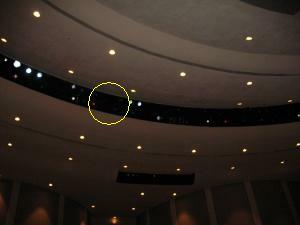 Behind those lights is the catwalk for the main stage, and the yellow circle is about where I was standing if you were standing on the stage looking up. Very high up, but very cool. Cross your fingers for next week’s Tech Tuesday. If all goes as planned and the stars align I’ll have something really cool to show you guys. If a performance looks great, but no one in the audience can hear anything, it can very quickly lead to a riot. Which is why we need Dean (who you’ll meet later) and a soundboard. Call it what you will, audio mixer, mixing console or mixing desk. This vital and giant piece of equpiment makes sure that any sound coming out of the speakers in CCA sounds like it supposed to. It also helps our sound techs know which microphones will pick up what sounds, and when they should come on or go silent. When you have multiple microphones, you have to make sure that no one will dominate the others, so you can hear the singer just as easily as the rest of the band. When a mic is not doing it’s job properly, the who performance is off. Sometime during April Dean may let me sit in on a sound check so you can see him and the board in action. Seriously though, this thing is a beast. I would have gotten in the photo to show how big it is compared to a person, but being in a giant empty and semi-dark theatre is down right creepy. I snapped my two pictures and booked it out of there. Yes I’m a giant scaredy cat. No shame.